Size: L, Color: Berry Pink Heather (Pink) is currently out of stock! Size: M, Color: Berry Pink Heather (Pink) is currently out of stock! Heading out in very cold weather? 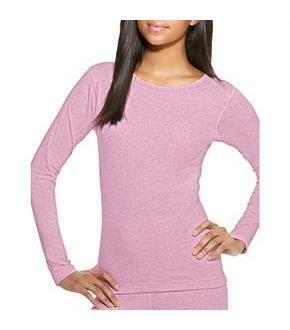 Wear this thermal shirt to stay comfortably warm during low-intensity exercise. 6-oz. mid-weight fabric has two non-bulky layers. Outer layer contains Merino wool for natural insulation. Inner layer is pure cotton, for softness next to your skin. Together, both layers trap air to create a warm thermal barrier. Sleek feminine fit follows and flatters your curves. Tag free for added comfort, with stretchy ribbed cuffs and non-chafe flat-locked seams. Great on its own or as base-layer thermal underwear. Note: Please note that there might be a delay of 3-4 days in shipping your order.